Many people use the phrase “But for the grace of God, there go I” as a way of expressing their personal account of God’s grace in and over their life. But my Uncle Junior has taken this personal account to another level by posing the question “Why do we need grace?” His answers are truthful and will compel you to be more deliberate in your use of this popular phrase. 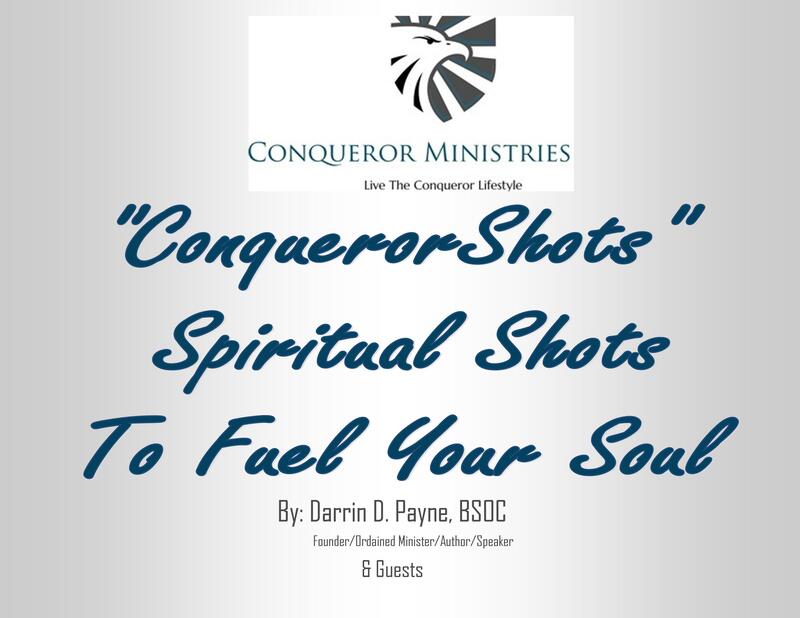 I am so grateful to him for his willingness to be of service to Conqueror Ministries by way of his writings. We will continue to deliver them to you even in the New Year. Please keep reading and get his spiritual shot of encouragement to trust God more. At this time I want to thank you, our readers, for continuing to stop by and choose a spiritual shot. May the God of all grace strengthen you, protect you and bless you during this holiday season and may the gift of a New Year be filled with precious accounts of His faithfulness in your life. So why is Grace so needed? Jesus said in John 6:37-44 KJV (37)All that the Father giveth me shall come to me; and him that cometh to me I will in no wise cast out. (38) For I came down from heaven, not to do mine own will, but the will of him that sent me. (39) And this is the Father’s will which hath sent me, that of all which he hath given me I should lose nothing, but should raise it up again at the last day. (40) And this is the will of him that sent me, that every one which seeth the Son, and believeth on him, may have everlasting life: and I will raise him up at the last day. (41) The Jews then murmured at him, because he said, I am the bread which came down from heaven. (42) And they said, Is not this Jesus, the son of Joseph, whose father and mother we know? how is it then that he saith, I came down from heaven? (43) Jesus therefore answered and said unto them, Murmur not among yourselves. (44) No man can come to me, except the Father which hath sent me draw him: and I will raise him up at the last day. John 6:65 KJV And he said, Therefore said I unto you, that no man can come unto me, except it were given unto him of my Father. This is not to be misunderstood – NO MAN can come to Christ unless he has been effectually drawn to Him by God the Father. This is why we need God’s grace. Every man who is so drawn will be endowed with the matchless grace of God through our Lord and Savior Jesus Christ. The gift of Eternal life also demonstrates His grace when He exchanges our human, sinful bodies for a glorified body, just like Christ’s at His resurrection, when we begin our eternal life. There are no exceptions to this clear teaching from God’s Word (the Bible). Of course most men think of themselves as “good” and “capable of doing good” and they are able to go to God on their own, whenever they feel the need to. This is the epitome of human deception. In your flesh you can NOT please God, nor can your human works make a difference to God. “Men are evil continually” Genesis 6:5 KJV And GOD saw that the wickedness of man was great in the earth, and that every imagination of the thoughts of his heart was only evil continually. ” Men love evil and hate good” Psalms 52:3 KJV Thou lovest evil more than good; and lying rather than to speak righteousness. Selah. “Men in the flesh (unregenerate state) cannot please God” Romans 8:7-8 KJV Because the carnal mind is enmity against God: for it is not subject to the law of God, neither indeed can be. (8) So then they that are in the flesh cannot please God. ” Men are under Satan’s control” 1 John 5:19 KJV And we know that we are of God, and the whole world lieth in wickedness. 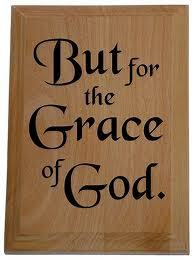 So as we consider the matter of God’s grace,and why we so badly need it, review this conclusion thoroughly. Ephesians 1:1-14 KJV Paul, an apostle of Jesus Christ by the will of God, to the saints which are at Ephesus, and to the faithful in Christ Jesus: (2) Grace be to you, and peace, from God our Father, and from the Lord Jesus Christ. (3) Blessed be the God and Father of our Lord Jesus Christ, who hath blessed us with all spiritual blessings in heavenly places in Christ: (4) According as he hath chosen us in him before the foundation of the world, that we should be holy and without blame before him in love: (5) Having predestinated us unto the adoption of children by Jesus Christ to himself, according to the good pleasure of his will, (6) To the praise of the glory of his grace, wherein he hath made us accepted in the beloved. (7) In whom we have redemption through his blood, the forgiveness of sins, according to the riches of his grace; (8) Wherein he hath abounded toward us in all wisdom and prudence; (9) Having made known unto us the mystery of his will, according to his good pleasure which he hath purposed in himself: (10) That in the dispensation of the fulness of times he might gather together in one all things in Christ, both which are in heaven, and which are on earth; even in him: (11) In whom also we have obtained an inheritance, being predestinated according to the purpose of him who worketh all things after the counsel of his own will: (12) That we should be to the praise of his glory, who first trusted in Christ. (13) In whom ye also trusted, after that ye heard the word of truth, the gospel of your salvation: in whom also after that ye believed, ye were sealed with that holy Spirit of promise, (14) Which is the earnest of our inheritance until the redemption of the purchased possession, unto the praise of his glory.